So your company is preparing to build a new shipping container-based headquarters, or maybe your city is ready to build a container-based library. Whatever your shipping container building plans are, figuring out where to begin can be daunting. After modifying shipping containers into structures for over a decade, we’ve observed that customers have the most success when their architect, engineer, container module manufacturer, local coding official, and contractor all communicate early and often. This is true for all construction projects, but it’s particularly important for container structures because they’re still relatively new to the construction world. To ensure your project goes as smoothly as possible, we recommend asking these four questions before breaking ground. Question #1: Who will be cutting the shipping containers for my building? We couldn’t agree more. Your contractor is a key asset for interior finishes and module assembly, but a manufacturer’s expertise will make a difference when it comes to large structural changes. In addition to offering insight into container types and procurement, modified shipping container manufacturers like Falcon Structures work with containers every day in a purpose-built facility. They can do cutting and welding faster, with better quality control, and often at a lower cost. 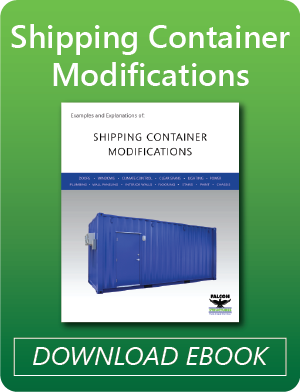 Once they transport the modified container to your site, a contractor can finish out the modules. Question #2: Can I see the facility where the containers will be modified? Before construction begins, ask your container structure manufacturer about their manufacturing plant, and beware of anyone who has a “no-tours-policy.” As container structures manufacturers ourselves, we’re proud to show off our facility so long as guests wear closed toe shoes and one of our spare hard hats. Shipping container modification doesn’t call for hermetically sealed labs and hazmat suits, and we can’t imagine a good reason to hide the manufacturing process from customers. Question #3: Does my structural engineer have shipping container experience? Shipping containers are strong but cutting indiscriminately can impact their structural integrity. They’re a bit like an empty can of soda: strong and stackable when intact, but easier to crush if an entire side is removed. Choosing a structural engineer with shipping container experience will save time because they’ve taken a deep dive into the possibilities and physical limitations of shipping container-based building. In other words, they aren’t learning about containers on your dime. An experienced manufacturer will be well-versed in installing the framing and support beams the engineer may suggest. If you and your architect are new to shipping container-based structures, you can contact your manufacturer for recommendations on container-savvy engineering firms. Question #4: What does my local coding official think about shipping container-based buildings? Your architect will likely already have a connection with local officials and an understanding of their policies and priorities. Before kicking off the project, have a conversation with these officials and come prepared with answers about safety, building use, and structural integrity backed by an engineer. In our experience, good will, transparency, and evidence go a long way to smoothing the permitting process. Think of your architect, engineer, manufacturer, code official and contractor as your shipping container-based building team; you’re going to need expertise from each of them to realize your vision. If you’re not sure who to contact first, a shipping container manufacturer should have relationships with the container-savvy architects and engineers who can get you started. Remember, if you ever need help or just have a few questions, Falcon Structures is always happy to be your boxpert. Interested in using shipping containers for your building? Our shipping container experts are happy to answer your questions. Call us at 877-704-0177 or email sales@falconstructures.com.